Today marks the start of the eight weeks I have to raise money for the Fashion for Paws event benefiting the animals and programs of the Washington Humane Society. For the next two months I will be highlighting all of the great work that WHS does to save the abused, abandoned and neglected animals of our community. WHS is the only Congressionally-chartered animal welfare agency in the United States and has been the leading voice for animals in the District since 1870. In addition to running both the Georgia Avenue and New York Avenue shelters, WHS funds the Humane Education Program, Humane Law Enforcement, and many other programs that help strengthen the bond between people and their pets. 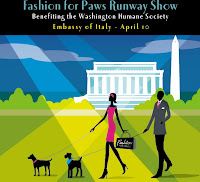 On April 10th at the Italian Embassy I along with sixty others will walk down the runway wearing the latest spring styles accompanied by fashionably dressed dogs. I am very honored to be representing Friendship and the only veterinarian to be participating in this exciting event. If you would like more information, to make a direct donation or to purchase tickets to the event please click here to visit my personal fundraising page. Check back on Tuesday to read my post about the horrors of puppy mills and how your support of organizations like WHS can help end the suffering of these innocent dogs.